Almost everyone has baking soda in their kitchen for use with cooking, and most people also know it’s very helpful with deodorizing etc. But baking soda is used pretty heavily in the Taylor Household for many other uses. (thank goodness you can buy * baking soda in bulk!) By using this one product for so many uses I’m able to clean my teeth with the very same product I use to bake bread or scrub the toilets. CRAZY, right??! Here are some of my favorite ways to use baking soda. Other than the obvious of using it for baking, I also use baking soda in the kitchen when scrubbing out the coffee stains in my mug. I have a small shaker of baking soda that I keep in the drawer next to my sink. When coffee stains begin to form I simply wet the mug, sprinkle a little baking soda on my sponge and in a snap my coffee mug is sparkling white again. 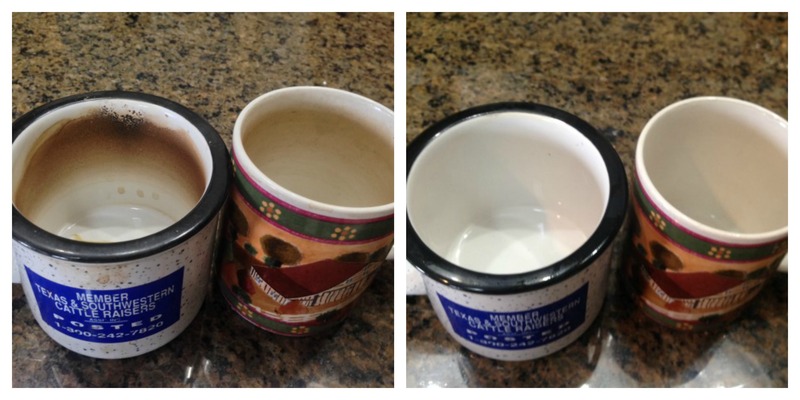 Clean mug – no chemicals. Magic! I also use baking soda for cleaning various kitchen surfaces. It’s a mild abrasive so if you’re scrubbing burnt-on food from your favorite pan, baking soda is a non-toxic way to get a little more elbow grease in! Just wet the pan and sprinkle some baking soda on a plastic scrubbie and usually that burnt-on mess is gone pretty quickly. 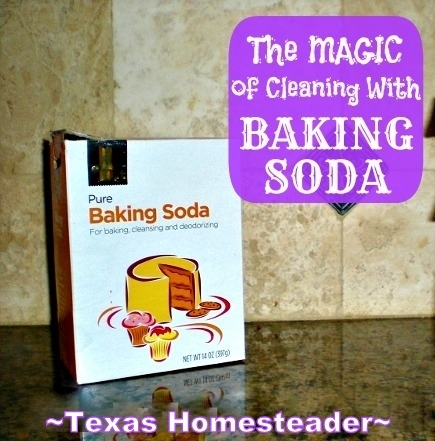 And baking soda is not just for the kitchen, I use it for cleaning other rooms in our home as well. It’s so helpful for cleaning bathroom surfaces and I have another shaker bottle that I keep stored in the bathroom for just this purpose. When cleaning my shower doors I use a vinegar spray first to loosen up any soap scum. After the vinegar spray has been left on the doors for about 30 minutes I sprinkle a little baking soda on my cleaning sponge and respray the bathroom doors with vinegar, using my sponge to scrub the soap scum away and then rinse – sparkling shower doors, very little effort… I really like very little effort when it comes to cleaning, how about you? I also use it in our claw foot tub in the same way. It’s really good at scouring away soap scum and leaving surfaces clean. With a quick scrub & rinse the tub is sparkling white. Of course that same scrubability (is that even a word??) comes in handy when cleaning the toilet too. I sprinkle some baking soda into the bowl and use my toilet brush to clean the toilet bowl to a sparkling shine. Why would I buy a specialty product to do what baking soda does for less money & less waste? But what about other cleaning uses? Well I’ve already mentioned that I drink coffee. LOTS of coffee. My dentist has told me it’s perfectly safe to use baking soda to help clean coffee stains from my teeth as long as I do so gently and not too often. CAREFUL – baking soda can be abrasive!! Since I’m not a big fan of the taste of baking soda I typically use a very thin film of regular mint-flavored toothpaste along the bristles, wet the brush and sprinkle baking soda on the top for a little extra stain-removing power. I think one day I may experiment with various ways to flavor the baking soda with essential oils or dried mint. Has anyone done this that can offer any advice? I’ve also used a baking soda / water mixture to wash my hair when we ran out of shampoo. It worked great and my hair was just as clean as using commercial shampoo after rinsing it out. I don’t use baking soda exclusively for shampoo as I’m worried it might be a bit too drying – can anyone weigh in here? So how’s that for a multipurpose non-toxic cleaner? Cleaning kitchens, bathrooms, teeth, face and hair in one very inexpensive box. Now that’s the kind of economy that really speaks to me! And the box it’s sold in is compostable as well, so since I’m using repurposed shaker bottles there’s not anything going to the landfill for all these products in one. * A word about our Affiliate Link – We are currently enrolled as an Amazon Affiliate. Occasionally I will insert an affiliate link into one of my posts if I think it may be of interest to you and both of the items linked in this post really help me in my canning endeavors! I receive nothing from the manufacturer, but I love my Tattler lids & thought you might too. If you click on any of my affiliate links and buy something (almost anything, not just what was linked) I get a small referral percentage from Amazon. But here’s the really important part – the price you pay for your items is UNCHANGED. 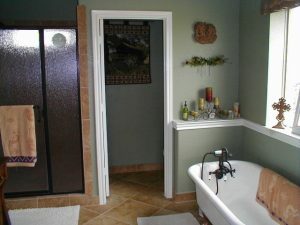 This entry was posted in Blog Posts and tagged Environment, Frugality, Make-It-Yourself on April 15, 2014 by Texas Homesteader. Still drooling over your tub… But YES, we love baking soda in these parts too! Great idea on the coffee stains in the mugs as I haven’t tried that one yet. Perhaps it will work on the tea stains in my tea pot too? Thank you for sharing these great tips on the Art of Home-Making Mondays! Thanks, I absolutely love that tub JES. It took 4 grown men (grunting & straining at that) to move that heavy beast into the house when we built it. It’s one of the old, heavy, well-made ones! I love the idea of using more baking soda on the shower door! It’s a mess and the spray stuff gives me a headache! Thanks for sharing your post at the HomeAcre Hop! Amazing all the uses for natural products like Baking soda, vinegar, etc..
I’ve been using baking soda for my hair for months and will never go back to shampoo. I switched in mid-winter, and the winter itching that normally drives me nuts went away. The greasiness is also gone. I can go for 2 days without washing my hair and it doesn’t get oily and smelly like it would with shampoo. I keep my hair short and tight, so I don’t bother with the acv conditioner. My daughter uses it, though, and she won’t go back to shampoo and conditioner. She has Locks of Love-length hair. Thanks for the hints! Love your link! Thanks for partying with us on the Four Seasons Blog Hop! Sandra from Scrumptilicious 4 You! Baking soda cleans up coffee stains, too?! That stuff is amazing. Thanks for the tips! I’m a baking soda believer too. I did try one of the diy toothpaste recipes – coconut oil and baking soda. It tasted awful so I added peppermint essential oil. It still tasted horrible. I have to confess I didn’t make but one batch. If you find a better tasting solution, please post it! I have been using baking soda to wash my hair for over a year now. I mix 1 teaspoon baking soda with 1 tablespoon water and that amount is perfect for my hair. My hair is on the oiler side and halfway down my waist. I don’t need the vinegar rinse either. When I first started the baking soda treatment it took about a week for my hair to get used to it. Now it works better for me than regular shampoo. Golly, I hope you don’t order your baking soda from Amazon. I went to your link and was amazed at the price! $25.99 plus $9.74 for a 5 pound bag?! I get that size at Walmart for about $5.00. Big difference. I use the no shampoo method for washing my hair. My hair is mid-length, so I use 1 1/2 tsp in 4 oz of water to wash my hair. I follow that with an apple cider vinegar rinse, 1 tbsp in 8 oz of water. I do not use the entire bottle each time, maybe 2-3 oz. I then rinse well. It does not seem to dry my hair out. My daughter and daughter-in-law have been using this method for much longer than I have. I use plastic squeeze bottles in the shower as dispensers. I use baking soda to make homemade deodorant. The recipe I use is 1/3 cup virgin coconut oil, 1/4 cup baking soda and 1/4 cup cornstarch or arrowroot powder. You can add essential oils to scent it, but I like the mild coconut scent. It is not an antiperspirant, but I like the way it works. I live in Texas also so it does help even in our brutal summers. I smell sweaty after working in the yard in the heat, but I did with commercial products also. I love it!! I do use baking soda for some things but thanks so much for the motivation for using it for more!! I love your blog and the cows and country look of the header.